Most anterior mediastinal tumors, such as thymoma, are indolent in the growth phase but they are potentially malignant in their clinical course due to neighboring organ invasion, pleural dissemination, and occasional systemic metastasis. Surgical resection should be considered for this kind of mediastinal tumor. 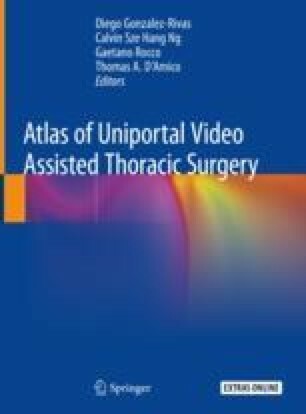 Video-assisted thoracoscopic surgery (VATS) has been widely used for mediastinal tumor resection since over 20 years (Yim AP, Kay RL, Ho JK, Chest 108:1440–3, 1995). A series of literatures has demonstrated its safety and that its oncological outcome is not inferior to sternotomy procedure (Shiono H, Kadota Y, Hayashi A, et al., Surg Laparosc Endosc Percutan Tech 19:424–7, 2009; Zahid I, Sharif S, Routledge T, et al., Interact Cardiovasc Thorac Surg 12:40–6, 2011). With the improvement of surgical skills and instruments, uniport VATS has achieved the same operation indication as multiport VATS. Although such an approach for a mediastinal tumor is feasible and may be preferable, caution must be exercised in some patients due to the difficulty of dissecting the involved vessels. The online version of this chapter ( https://doi.org/10.1007/978-981-13-2604-2_9) contains supplementary material, which is available to authorized users.